The Feast of Saint Joan of Arc – Zero Equals Two! 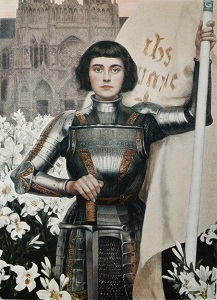 Joan of Arc, nicknamed “The Maid of Orléans,” was born in 1412 in Domrémy, Bar, France. A national heroine of France, at age 18 she led the French army to victory over the English at Orléans. Captured a year later, Joan was burned at the stake as a heretic by the English and their French collaborators. She was canonized as a Roman Catholic saint more than 500 years later, on May 16, 1920. While it’s unlikely that a peasant girl like Saint Joan would have had the pleasure of eating this, the bouchée à la reine (a savory pastry, literally translated, the “mouthful to the queen”) is a culinary delight originating in the Domrémy area. In honor of her feast day, why not try one today? Cut out two 10cm squares of puff pastry per vol au vent (or use a cutter to create a different shape). Cut another square from inside one of them to get a roughly 1cm ‘frame’ Egg wash the bottom square then place the frame onto it and egg wash again. 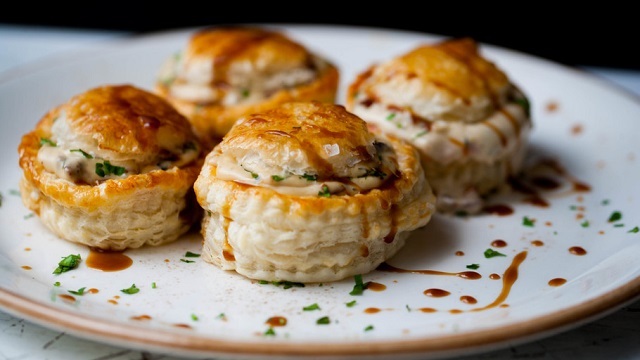 Place the vol au vents on greased baking tray and bake for 10 minutes. Leave the pastry to cool slightly, then using a small knife carefully cut out the ‘lids’ from the middle. Roughly chop the mushrooms. Peel and dice the onion. Add the butter to a frying pan and heat over a high heat until the butter is foaming. Add the onion and the mushrooms and fry until the mushrooms are well caramelised and soft. Add the wine and reduce until it’s almost dry, then add the parsley and combine. Reduce the wine for the sauce by two thirds and taste. It should be sweet and a little acidic Pour the chicken stock for the jus into a small saucepan. Bring to a boil and reduce to a low bubble. Reduce for about 1 hour, until it thickens slightly, to a loose jus (not too syrupy, but you can always let it down with a little more water). Add the reduced wine to taste and season with salt and pepper to taste. In another small saucepan bring the milk to the boil with the thyme and the porcini mushrooms. Simmer for a few minutes then remove from the heat and leave to infuse for 30 minutes Melt the butter in a medium sized saucepan then whisk in the flour and cook for a minute. Remove the thyme and the mushrooms from the milk and slowly pour the milk into the pan, a little at a time, whisking until smooth before adding more. Finish by adding the cream and season well. Throw away the thyme and save the mushrooms. Roughly chop them and toss through the fried mushroom mix. Tip the mushroom mixture and 2 tablespoons of the chicken jus into the béchamel and stir. Heat the pastry shells in the oven for a few minutes, then remove and fill with the béchamel mix, then pour over a little jus.